It’s a humid, summer late afternoon, the butterflies cease flittering and land. They fold their wings for the day and seek the refuge of the taller grass. At the same time, a sudden hush of bird sounds seems harshly loud in the silence. The air smells pure, ionized… slightly stinging the nostrils; a powerful menace appears in the darkness in the form of an upward rising thunderhead off to the west. Those frightened blue eyes tell me that it’s time to face the danger. To learn what lightning is all about and proceed to maximize our safety. The National Weather Service records about 25 million cloud-to-ground lightning events each year. One hundred million volts, fifty thousand degrees and sometimes over five miles long, certainly, lightning is not something to trifle with. Each bolt contains enough energy to power the Unites States for about 15 minutes. On average, about 160 people are killed each year by lightning and almost ten times that are injured. Over ten thousand forest fires in the U.S. are blamed on lightning each year and billions of dollars lost in crop damage due to hail and wind are associated with severest of thunderstorms. With 25 million lightning hits a year, it seems logical to ask: what are my chances of being struck? The answer, of course, depends heavily on your location and circumstances during and shortly after the storm as we will see later. Even so, most of us are somewhat blithe about the appearance of a thunderstorm on the horizon, after all, we’ve seen so many summers, so many thunderstorms; we’ve lived through each and every one of them and haven’t been hit yet. Many of us, myself included, have not even seen an up-close and scarier-than-hell lightning strike other than on TV or the big screen. Lightning blasé is like working with dangerous chemicals every day, you build up a good history of accident-free safe handling episodes and then, over time, you lose the respect you should have for the danger. Then wham! It strikes without warning and you lose a finger, a lung or an eye to a split second turn of events that could have been avoided. This is the nature of the unpredictable, chaotic danger of lightning, this stuff happens, and it could happen to you. So, what is the chance of being lightning struck? A paper published by Orville and Huffines in 2001 in the Monthly Weather Review calculated the statistical likelihood of an individual being killed or injured by lightning in any given year. They found that there is a 1 in 240,000 chance that you will be struck; that’s about equivalent to one out of every quarter million people will endure such a calamity. Well, that’s not an exceedingly likely threat, but over a life span of eighty years, that probability increases to 1 in 3000 over your lifetime. Taking this one step further, suppose that you have an inner circle of 10 family members, including the extended family and/or in-laws, or even animals (although this data is uncorrected for the typically shorter life span of pets). Now, according to Orville and Huffines, you are looking at a 1 in 300 chance of someone in your family (or animal) suffering a lightning related injury in your lifetime. Here, I begin to feel the clammy breath of annihilation knocking at my door. This is bringing the danger too close to home to ignore. Still, there are some things we can do to manipulate the odds in our favor and enhance our safety. But first let’s take a look at how thunderstorms are created and how and why they produce lightning. Knowledge is often the key to releasing fear’s nasty grip on our everyday life. Most, but not all lightning is associated with thunderstorms. Volcanoes, intense forest fires, nuclear detonations, even severe snowstorms and sandstorms can and do produce lightning. But the lion’s share of what we endure in North America stems from thunderstorms. So it is this I will focus on. Atmospheric instability is quite common and occurs when warm air is surrounded by cooler air. The natural difference in density between the two causes the warm air to move upwards relative to the denser cool air. When the rising warm air is humid, at some elevation it cools to the dew point (becomes saturated) and moisture begins to condense out to form a cloud. Air temperature for dry air decreases around 5.5 degrees F for every 1000 foot rise in elevation while saturated air cools less (averaging around 3 degrees F per 1000 feet) with increasing height. Thus, the rising moist air of the cloud remains warmer than the surrounding dry air and so the instability remains in place. Eventually the temperature reaches the freezing point and the condensed moisture begins to either form small ice particles or remains in a super-cooled liquid state. As the ice particles are dragged aloft by the upward moving air, more and more moisture droplets condense out of the air onto the growing ice particle. At some stage of the ice particle growth it succumbs to the force of gravity and begins to fall as precipitation. Meanwhile an upper atmospheric disturbance called a divergence creates a driving force that accelerates the upward flow of air even more than the normal density driven instability. This forced upward flow causes an increase in friction between ascending ice particles and the larger bits of frozen ice descending as hail. 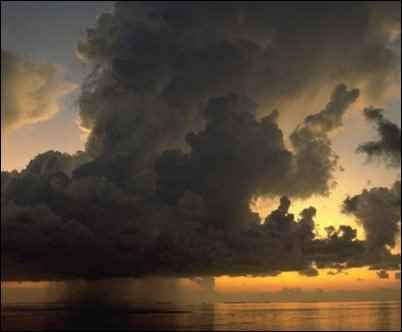 Fueled by the rising warm and moist air continually fed at the base, the thundercloud grows vertically to tremendous heights sometimes reaching to the top of the troposphere where it ceases to grow vertically. At the tropopause, the upper most discontinuity between the troposphere and the stratosphere, a temperature inversion occurs whereby temperatures actually begin to rise with increasing height and this puts an abrupt halt to the instability condition. Here, at the tropopause or wherever the instability extinguishes, the thundercloud spreads laterally instead of upward and forms the classic anvil shaped top. 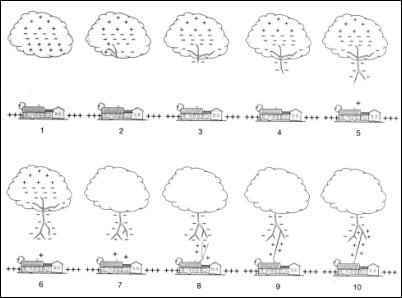 Ascending and descending ice particles may recycle several times before growing to a sufficient size to overcome the upward force of the rising air and fall to the ground as a torrent of precipitation (rain or hail). The friction between the ascending and descending ice and hail creates a condition whereby electrons are stripped from the upward flowing frozen moisture creating small positively charged ice particles that collect in the upper regions of the cloud and negatively charged hail in the lower region of the cloud. Ultimately, a tremendous charge distribution builds up within the cloud. The negatively charged cloud bottom forces a positive charge build-up on the ground. In a short time a very high potential difference forms between the top and bottom of the cloud as well as between the bottom of the cloud and the ground as shown in the diagram below. Air is a pretty good electrical insulator but it only has a finite ability to resist this potential so when the voltage builds to about 915,000 volts per foot, the insulating properties of air breaks down. When this happens, charge attempts to transfer through the ionizing air in the form of stepped leaders and ultimately lightning appears in an effort to neutralize the potential difference. 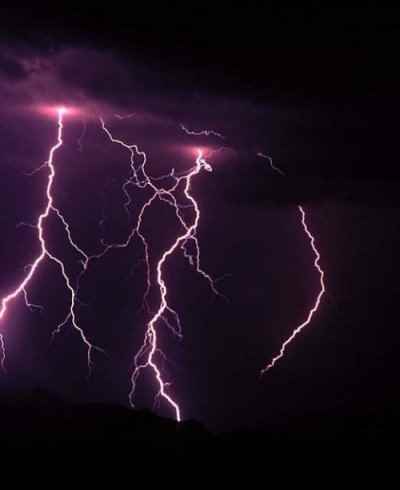 When contact is made between the return stroke and the stepped leader, the lightning path is created and a tremendous surge of electrons flow down his path from the cloud to the ground. Even so, this is not the lightning we see. The visible flash we identify with a lightning bolt is the subsequent flow of positive ions back up this path. It generates tremendous heat, literally hotter than the surface of the sun, and explodes the air in its path. This heated, violent expansion of gas is what creates the visible bright flash of lightning. The viscous expansion of air creates a sound wave that we experience as thunder. 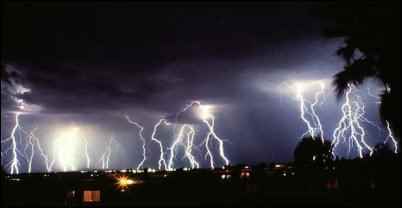 Cloud to ground is a dangerous form of lightning as it can strike people, animals, buildings as well as start fires. Only 20% of all lightning is of this variety. It is characterized by the brilliant forked flashes that appear to extend from the base of the cloud to the ground surface. This displays itself as a red or yellow flash buried in the clouds. Usually, no lightning bolt is visible, just a glow within the cloud. The lightning can be from one cloud to another or within the same cloud. It is actually the most common form of lightning and, except for some radio or TV interference, has little effect on us here on the ground. Airline traffic, however, is very concerned with this phenomenon. This form of lightning is not as common as the cloud to ground variety although it strikes the ground as well. It arises from the top of the thundercloud where significant positive charge has accumulated and strikes the ground way off in the distance, often miles from the thunderstorm, where the ground potential has returned to it’s normally disposed negative charge. It is actually a more dangerous form of lightning because it occurs so far away from the storm. Often, we have been lulled into thinking that the lightning threat is over due to the increased distance of the thundercloud; we resume outside activity and then out of the blue it seems, lightning strikes. This is a very rare and skeptical form of lightning. It is believed to be non-lethal. Ball lightning is rarely seen and the reports are of a glowing sphere less than 40 inches in diameter. It either floats in the air or wavers in a slow horizontal path. 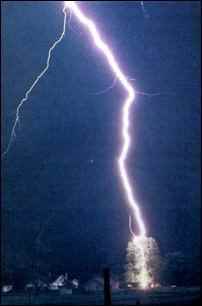 There are no known photographs of such lightning, only first person eyewitness testimony periodically through history. Because of this., some researchers believe that ball lightning doesn’t exist at all and suspect that it is a an individual’s physical malady as it bears a strong similarity to hallucinations that accompany epileptic seizures. Chaotic, unpredictable, and deadly, lightning is serious business and no one is completely safe from it. Through the ages, lightning, like passages in the bible, suffered a multitude of misinterpretation. The key to remaining safe, or so it seems, just like the key to obtaining eternal salvation, depends on who you talk to and when! However, just because some technique has worked well for someone somewhere, does not necessarily mean it is safe or good enough for you or I. There is too much at stake here: personal safety, safety of the animals, safety of the homestead,… I’ll take my cues from the people that study thunderstorms and weather professionally. I’ll forgo the folklore remedies that generations of old-time farmers here swear by. Personal safety and the safety of my family and home are just too darn important to me. 1. When you first hear thunder, drop what you are doing and get inside! Get inside a house or building, not an open shed or 3 walled structure like a picnic shelter… a completely enclosed house or building and one that has plumbing and electrical wires running through it in a more or less conventional manner. 2. If it is not possible to get indoors, get inside a vehicle. This must be a fully enclosed metal one, not a convertible or a fiberglass car; choose a metal car that has a metal roof. Roll up the windows and don’t touch anything metal. See the sidebar entitled The Gaussian Surface. The National Oceanic and Atmospheric Administration (NOAA) uses the slogan: “When thunder roars, go indoors!” to indicate the primary safety route to take if at all possible. This agency encompasses the National Weather Service (NWS), our government’s voice in issuing vital weather related warnings and information. They take lightning seriously and study it with tools, probes, data logging and all the professional gadgets that we do not/would not have at our disposal. They’ve come up with suggestions in addition to the above primary tips to maximize your safety. Once inside, do not use the telephone (a conventional land line); but cell phones are ok to use. A lightning strike can travel through phone lines and then through you to ground. It doesn’t even have to be a direct strike as induced current from a nearby strike can kill or injure just as easily. Stay away from the bathtub, shower or any other water-carrying fixture in the house. Your plumbing is one of the safety paths for lightning to flow to ground. You do not want to be part of the ground path so refrain from touching metallic faucets, sinks, pipes or drains. The toilet is kind of a different animal. Most toilets are sealed porcelain units and porcelain is a great insulator. Still, there’s water there, inches away, and if lightning can ionize air… Well, I won’t say anymore. Electrical appliances should be turned off. Battery operated items are ok and in fact, very useful, especially radios to stay informed of any weather related emergency information. It doesn’t take much of a surge to totally destroy today’s electronic gadgetry. If you are caught outdoors during an approaching thunderstorm, get into a metal vehicle (non-convertible, non-fiberglass). Roll up the windows and do not touch any metallic parts. If you are driving, use common sense and pull over if it is appropriate. Keep in mind that if a lightning strike hits the car or just nearby, in all likelihood the bright flash will momentarily blind you making safe driving all but impossible. If escape to a vehicle is not possible, your potential risk is magnified. Do not go under a tree. Lightning tends to strike tall objects. Do not seek shelter in a 3-corner shed or open structure like a pavilion or gazebo. They may offer protection from the rain but not lightning. Avoid open areas and high ground. Move quickly to a lower elevation and seek a low spot such as a ditch or valley. Do not lie down, rather, minimize your ground contact. If you experience any of the symptoms that lightning is about to strike (see Lightning Proximity Symptoms sidebar), crouch low, keep your feet together, or better yet balance on one foot if at all possible to minimize surface contact with the ground. Cover your ears as the thunder will be deafening. If you are in a group, spread out. Do not congregate closer than 15 feet to each other. When a thunderstorm is on the roll, use the 30/30 Rule to determine the proximity of the lightning and when it is safe to move out from a safe place of refuge. When you see a lightning flash, count the number of seconds until you hear the associated thunder. Since sound travels approximately 1 mile in just under 5 seconds, you should be on your way to a safe refuge when the seconds count is 30 between lightning flash and thunder clap. That puts the distance between you and the storm at about 5 to 6 miles. You should remain in your safe refuge for 30 minutes after you see the last lightning flash. Even then, stay alert for the rare but real threat of positive lightning after the cloud has moved away. No one is completely safe from lightning. There are some things you can and should do to maximize your safety but the bottom line is: Lightning is a natural phenomena, highly unpredictable in behavior and potentially lethal in consequence. Do all you can ahead of time to protect yourself, your family, the farm animals, your possessions and home. Visit the references supplied in this article for more information. Post emergency numbers, first aid information, and first aid kits in an accessible place. Get a cell phone and develop a plan for dealing with fire and lightning hazards. Knowledge is the key to unlocking the fear within. 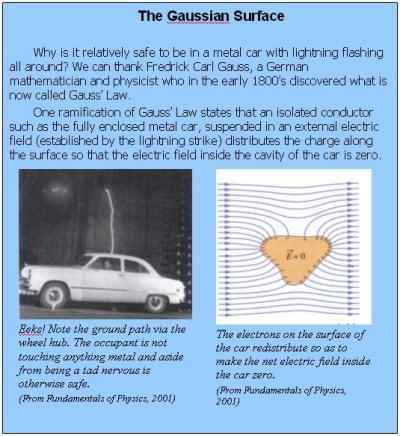 But in the case of lightning, my fear did not subside by researching the phenomena. I gained an enormous respect for the degree of danger that accompanies a thunderstorm. It’s a fact, lightning is a killer, serious business, and safety, at best, is only a gamble. I’ve put the odds in my favor by learning about it. Nevertheless I still have some unanswered questions to be addressed. Perhaps these apply to you as well so I’ll list them and maybe together we can find solutions to these or other concerns and post them on our forum. The following are signs that lightning is about to strike. DANGER! If you are outside and you sense any of these symptoms, you are in extreme danger! Lightning is about to strike! Remain low and minimize your body’s contact with the ground. Crouch down on the balls of your feet with your hands on your knees and your head between your hands. If you can, pick up one foot to further minimize the contact you are making with the ground. 1. My water supply is supplied by a well. I have plastic pipe feeding the water system from the well to the inside fiberglass water tanks. There is a one-way valve between the above ground pump located in the house and the well which keeps the internal plumbing filled with water so as not to lose the prime on the pump. Downstream of the one-way valve, the water drains back into the well using plastic pipe to keep it from freezing in the winter. Thus there is an interruption of water between the pump and the well. This means that there is not a complete electrical ground path between the well and the house and therefore I am unprotected from a direct lightning strike. 2. I have a metal roof. I also have 3 roof-mounted wind generators on metal poles attached to the house. Each pole (1.5” sch 40 pipe) is grounded to a brass rod sunk into the ground adjacent to the house. My electrical system (12 volt) is also grounded there. Each pipe goes to ground via an 8 ga. copper wire. 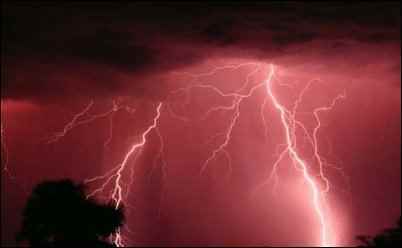 Lightning produces 100,000,000 volts, 30,000 amps and enough heat to vaporize a wooden house. What conductor could possibly withstand a direct hit and safely bring the charge to ground without igniting a fire? If after reading this article you have some lightning related concerns, either post them on the forum if you are a member or email them to me using the contact information available by clicking on my name at the top of each page. I will post them and direct you to an appropriate resource if at all possible. Here are some additional references providing additional information about lightning and lightning related safety information. Phyllis Engelbert, The Complete Weather Resource Vol. 2, U.X.L. an Imprint of Gale Research, 1997. Orville, R.E. and Huffines, G.R., 2001: Cloud-to-ground lightning in the United States: NLDN results in the first decade, 1989-1998. Mon. Wea. Rev., 129, 1179-1193. Halliday, Resnick, Walker, Fundamentals of Physics Sixth Ed., John Wiley & Sons, 2001.